Want a fun project for for you to do with your kids? Try a Crystal Garden. It's amazing how your garden will change on a daily basis. But just remember, once your garden is set DO NOT TOUCH, it may disturb the unique process. I found this great recipe in "Crafty U"
Step 1 - Place briquettes in freezer bad and break into chunks with a hammer. About 1 inch in size. Put chunks into your small bowl and cover with distilled water. When completely saturated (bubbles will stop floating to the top) drain out excess water and transfer pieces to your pyrex bowl or pie plate. Step 2 - Using your air tight jar, combine ammonia, salt and laundry bluing. Mix well. 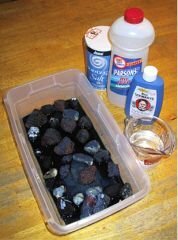 Pour half of that mixture over your briquettes and then cover you jar with air tight lid. until you need it again. Step 3 - Scatter drops of food coloring over the briquettes. Then sprinkle Salt over also. Step 4 - Set your project aside in a safe place (away from young children and pets). Check it every day to see the growth process. When the bottom of your bowl becomes dry, add a little more of your ammonia mixture. But remember to shake up mixture before adding. The settled mix will not work as well. Do not pour over the crystal they are fragile. Just add to the bottom of your dish. GROWN-UPS.... The mixture, which contains dissolved salt, is drawn up through the pores in the briquettes and evaporates, leaving behind layer upon layer of salt-crystal formations. This process continues until all the liquid evaporates. The colors come from the liquid absorbing the drops of food coloring on its way up. OMGOSH..what an amazing project for Chaz and I to do at home. This is a great way for them to learn about how crystals grow in caves too. Thank you soooo much for sharing this!! !